My First Map! Constructive criticism welcome! 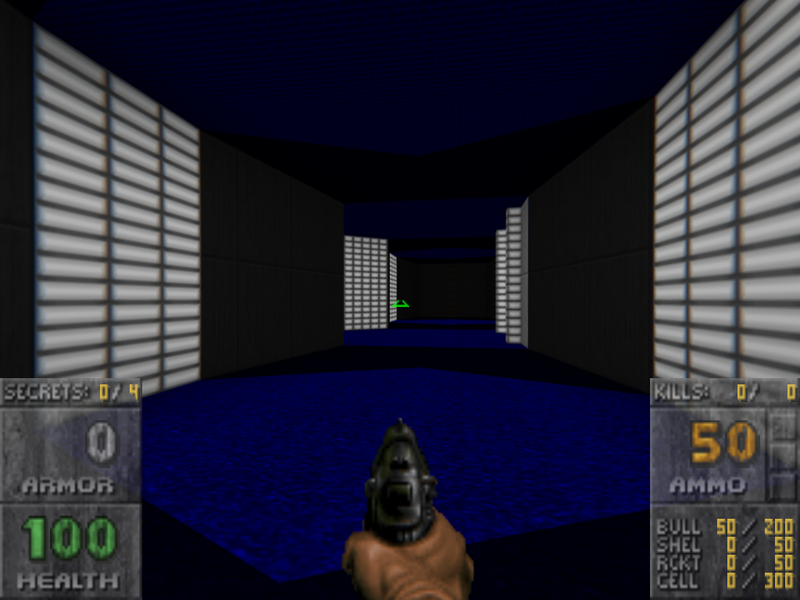 Hey so I'm new to doom modding and I just finished my first map. I know it won't be very good because its my first map ever but I would love it if some people could play it and give some tips. Tell me what I did wrong and how to fix it or what to watch out for next time. Hopefully they'll be some things you think I did ok at as well. That sort of thing. 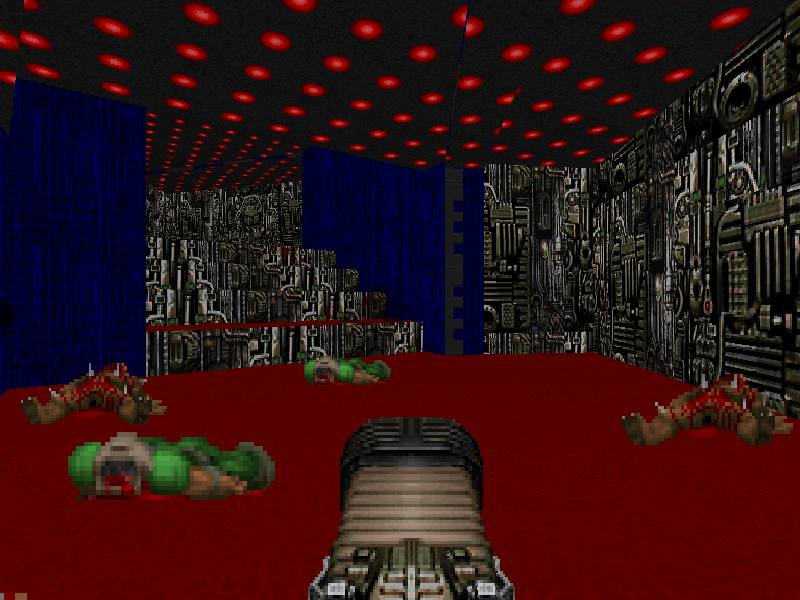 Anyway My map Is for OG doom. E1M1 Replacer. It took me 3 days to make it. (I spent about 3 hours a day working on it so about 9 hours total) It's a short map. About 2 to 5 minutes long. 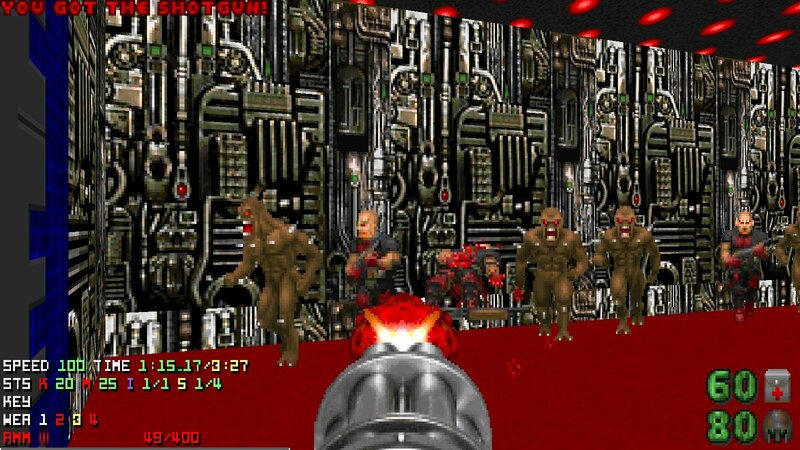 I Tested it for GZDoom so use that. Had a look. Seems pretty neat for a first map made in 9 hours. -Careful with colours near doors. Some doors look like they may need a blue key when actually they need none. -Blocking players with a pack of spectres down in that dark area causes nothing but grind. Consider using the ambush flag in areas like this so it doesn't turn into a camp-fest, or straight up avoid anything that can cause these up and down elevator grinds against pinkies/spectres. Neat lighting effect -- the door is glowing. 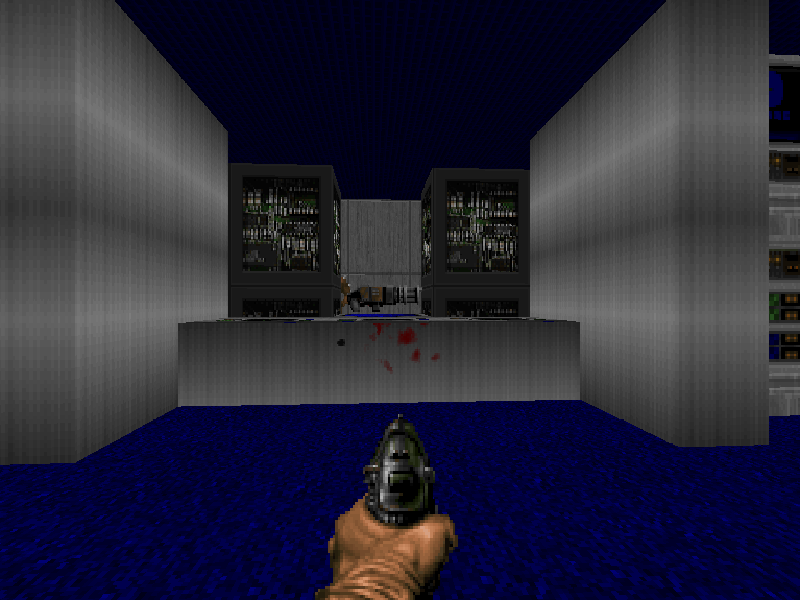 However, beyond this and another area I'll get to later, the map is pretty much uniformly lit. Usually not ideal. 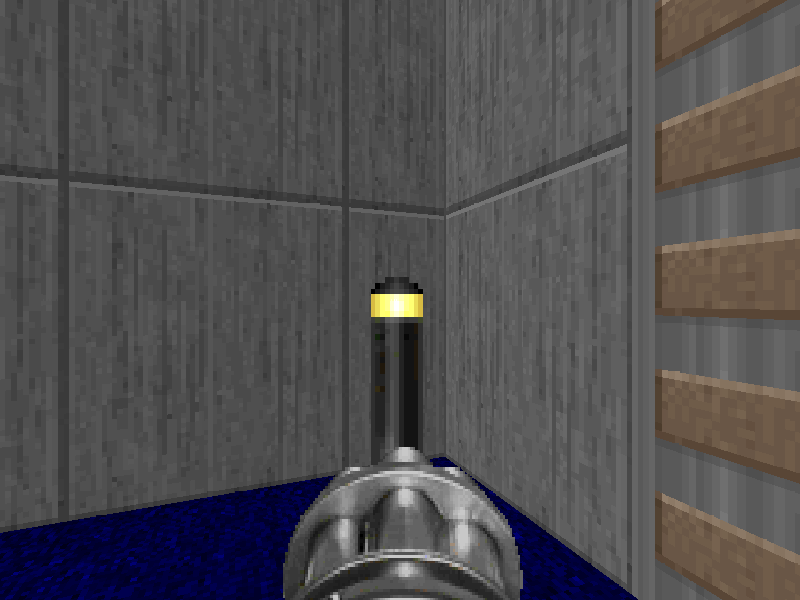 I like how the chaingun is teased as an objective. Choice of which of three branching paths to explore is up to the player, all fine and dandy; I happened to go here first out of chance. 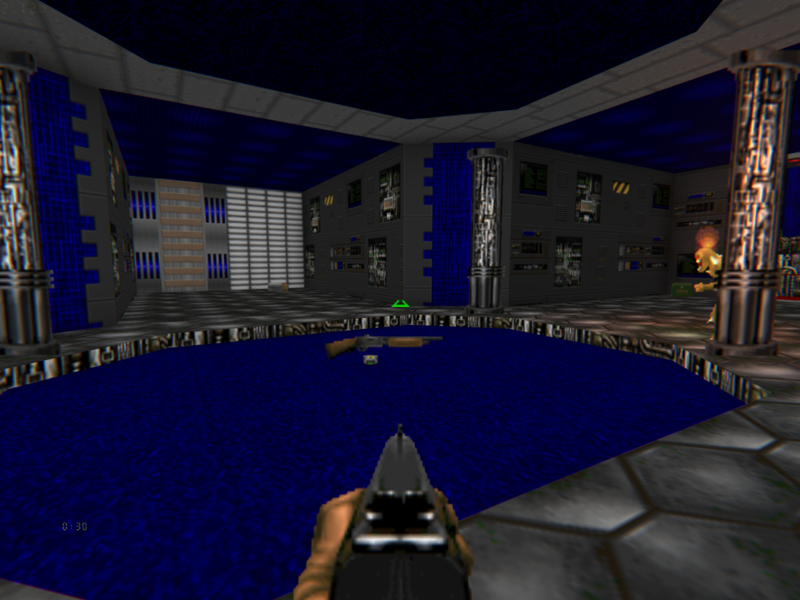 Two things in this shot: blue carpet doesn't make a lot of sense as a flat for the silver footstep, and the room height is such that the computer panels are sunk into the floor. 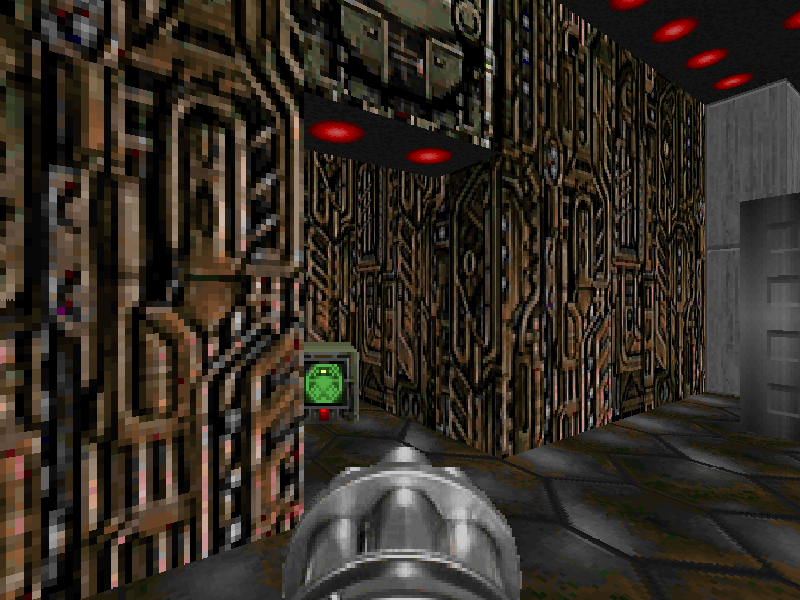 Alignment of the 64-wide gray panels is a bit 'free' at times, e.g. here and here. Easiest to choose wall segment lengths in increments of 64. 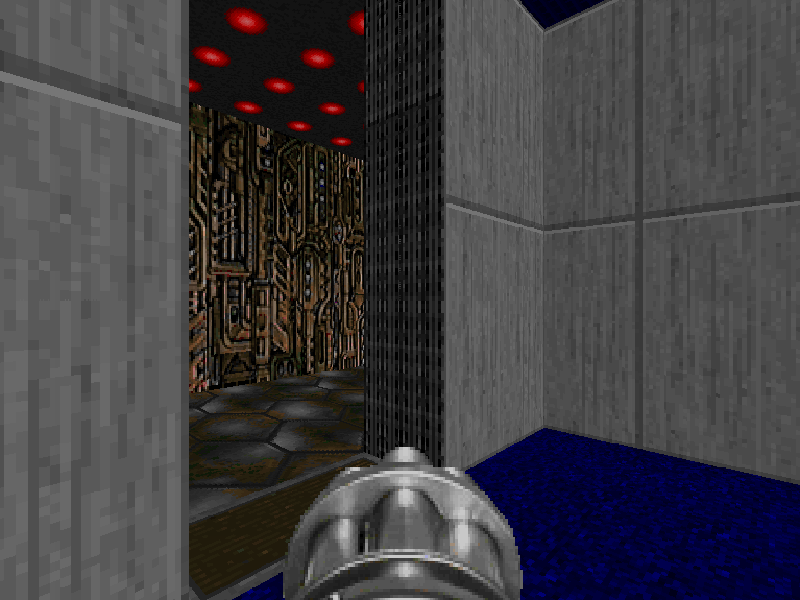 - Observation: all rooms so far, and many in the map, are rectangular and entirely flat, which is commonly presented as a 'no-no' in mapping dogma. I'd say that a more accurate way of putting it is that the rooms could use more interesting visual or structural ideas -- an absence of those often manifests in flat, entirely boxy rooms. 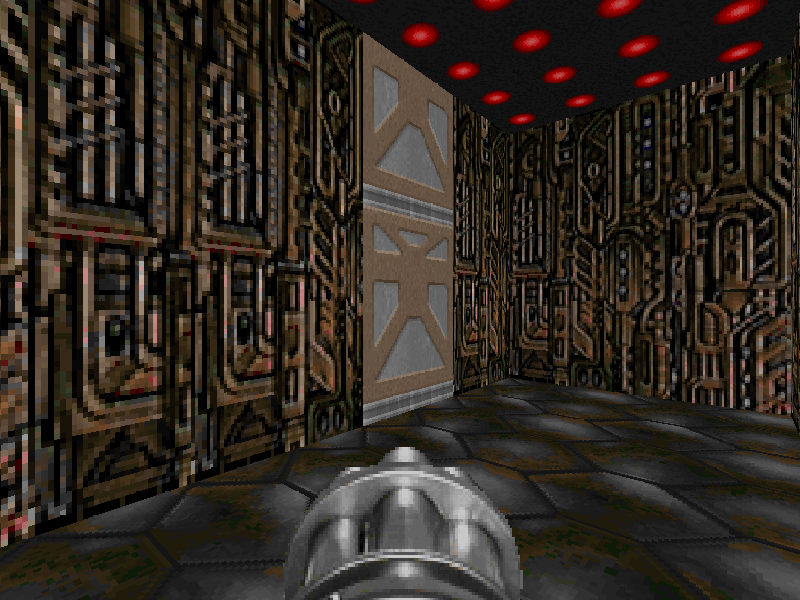 A similar thing can be seen in the transitions from room to room, which are mostly common doors. At your disposal are also: drops, stairs, lifts, visual-only transitions (e.g. windows), open physical transitions (well, openings), list goes on. Lower unpeg sides of walls if you want them to stay put when the ceiling rises. The area map means the remaining secrets are free in this map, since it is a small map and all secrets are either pushwalls or hidden backways. And speaking of lifts and windows. :) Alignments of the window (window itself, and sides) can be adjusted. Use of this door texture calls for a lower ceiling. On the subject of doors -- ll -- it's common to inset them into the treshhold as such -- [ll] -- rather than situate them parallel to the adjoining wall. I also noticed a common technique of flat borders at doorways between texture changes. Works here, although not everywhere. 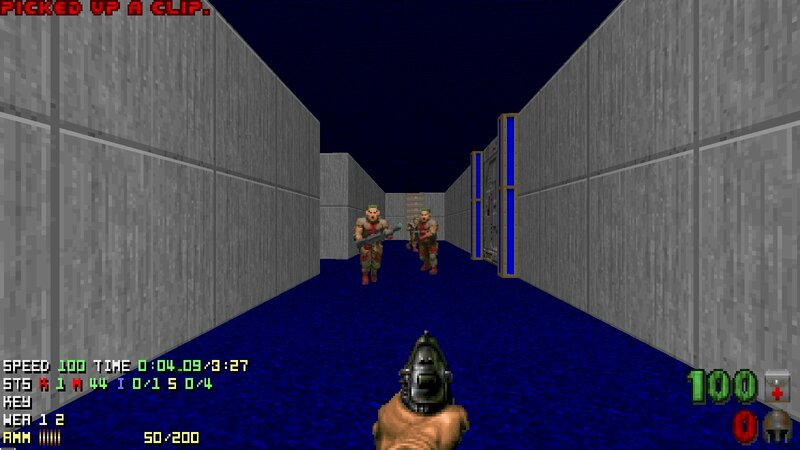 Up the last remaining path, we get our first ambush: shotgunners on one side, imps on another. Mark these spectres ambush/deaf (exact thing the flat is called depends on editor) if you don't want firing a shot to lure them all to the doorway. Probably a good idea since they lose their surprise value this way. I like this asset combo. Alignments are pretty loose but okay. The closet traps are a good idea: I like how they can cascade. RL and PR secrets are both useful from the perspective of maxing the map. Using 'obvious' monster-blocking lines in the playspace is often discouraged (they are mostly a 'janitorial' tool) but this is a good case of where they work: they make visual sense instead of being arbitrarily placed. I like how that baron is sort of the 'overseer' of that back area. At this point it's obvious that the texture transitions and alignment is rather loose by intent. In this case, some of it works, some of it looks like mistakes regardless: most notably the silver strip of the caco closet doors being visible (you can use a ceiling raise effect to move it all the way to the top). The asset and color combo is fun though. It also strikes me that the map has two separate modes: one is the quasi-realism of the more conventionally shaped areas, another the more 'oldschool', iwad-like style of these recently covered areas. There's no clear demarcation of techniques used in either -- misalignments are present in both, for example. That leads to them undercutting each other; when I got to these areas it was harder to separate 'sloppy design' and 'tastefully loose'. Anyway, hope this helps. Keep making maps. Thank you so much for playing my map! You're right. I need to do a better job with aligning textures and what not. do you have any good tutorials specifically for texture use? Anyway thanks for the tips! It does help. And I will keep making maps! Thanks for the review! I'd suggest playing good maps and looking at stuff. Simpler forms of alignment is something you'll probably figure out quickly. @rdwpa covered pretty much everything. 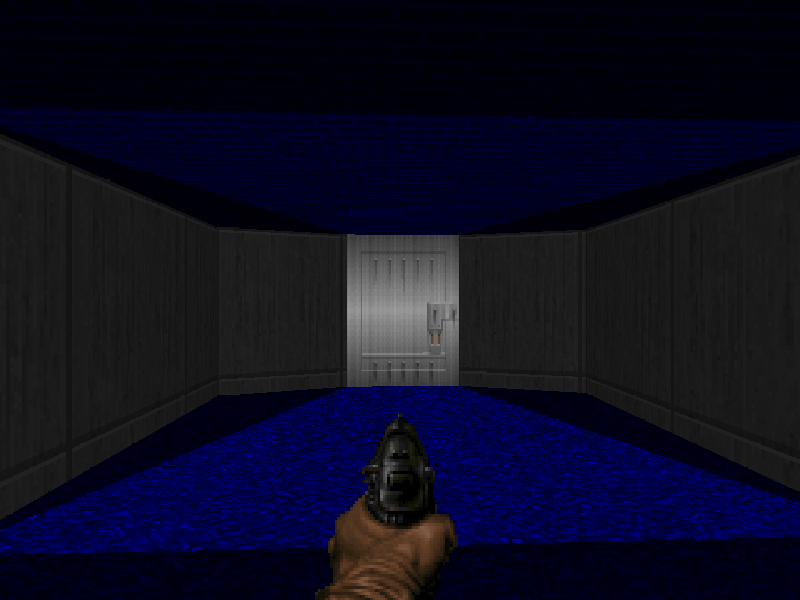 The flow of the level was good, I appreciated that you didn't have to grab a key then backtrack to the door. The biggest things that jumped out at me as areas to improve on were the lighting and detailing. The lighting was the same throughout almost the whole map which made it feel quite flat. 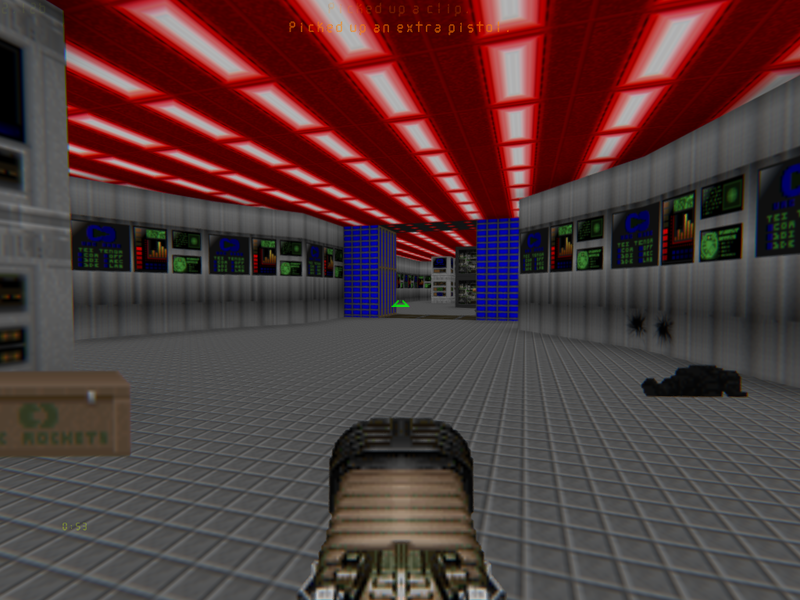 Varying the lighting level and ceiling heights would go a long way in making the map look more interesting. For a first map, I'd say it wasn't half bad. I don't think it's necessary to reiterate many of the points other folks have made, so I'll just suffice it to say that it wasn't all that bad. I will point out one thing, though. 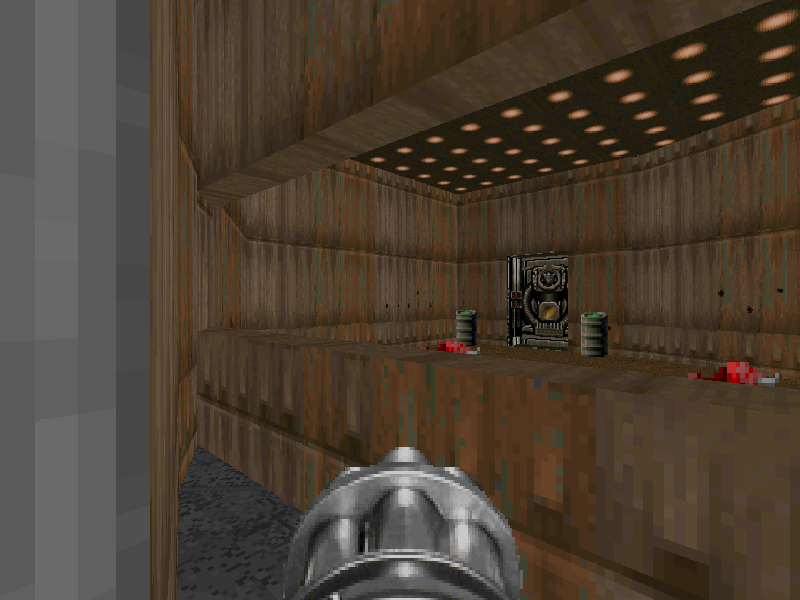 You left tons of pistol/chaingun ammo lying around, but there was no chaingun. So alright, it was off in a secret. But secrets are things that should be looked for when frantic fighting is not going on. They should be things players can retrace their steps to try to find, like, when the fighting in an area is done. 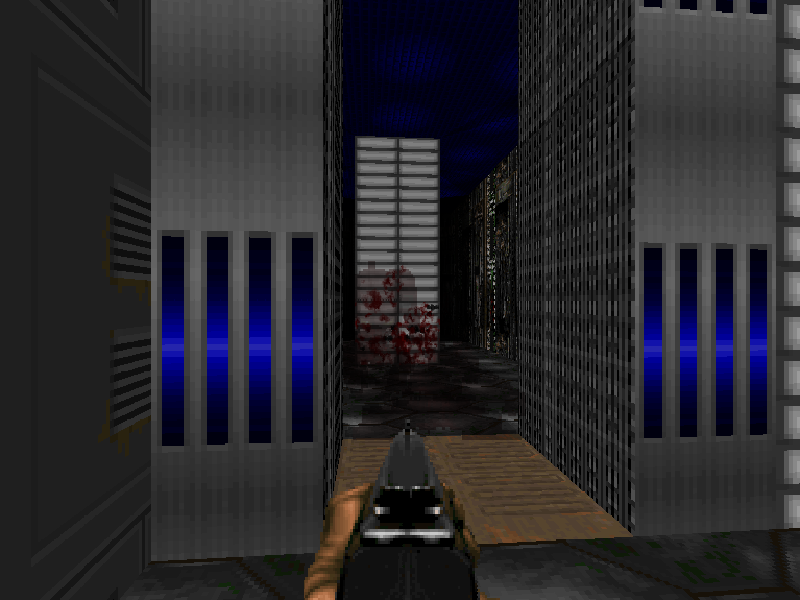 I was left battling with the shotgun, and running low on ammo, thinking that maybe all those bullets was because the developer meant for me to fight with the pistol. Secondly, way too much use of computer textures. 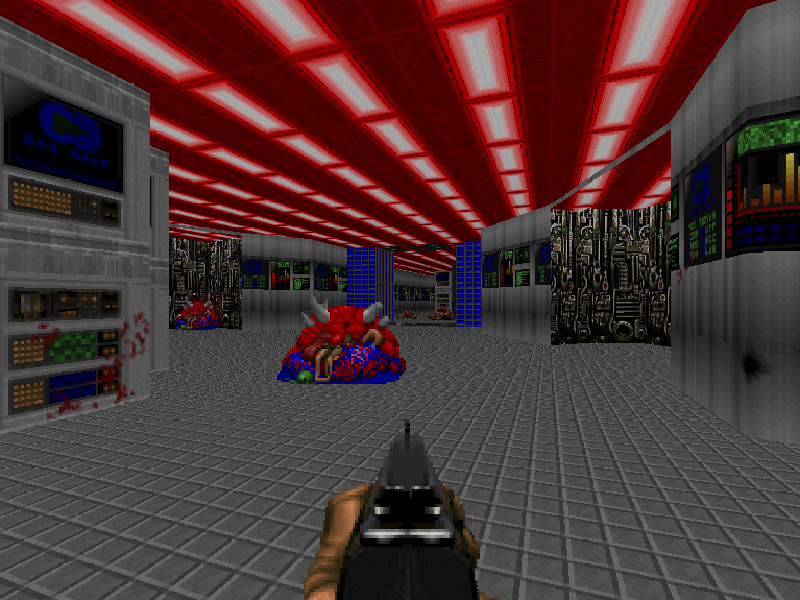 It gave the map a much too uniform feel. There wasn't the notion that you were really in a place. That's something to work on. Here's a video about Romero's rules for map-making. You'll note one of the rules is to give players a sense that they are in some kind of place. But don't worry. That sort of stuff will come with practice. Also, one other thing. If you have light, be sure there is some kind of light texture to 'cast' the light. The first door. It was meant to be casting the light? Seldom a good idea, especially for a starting point, especially if your aim is to have your players suspend their belief and get emersed in your map. So that's all for now. A great first try. And here's to hoping for more! Thanks for playing my map! 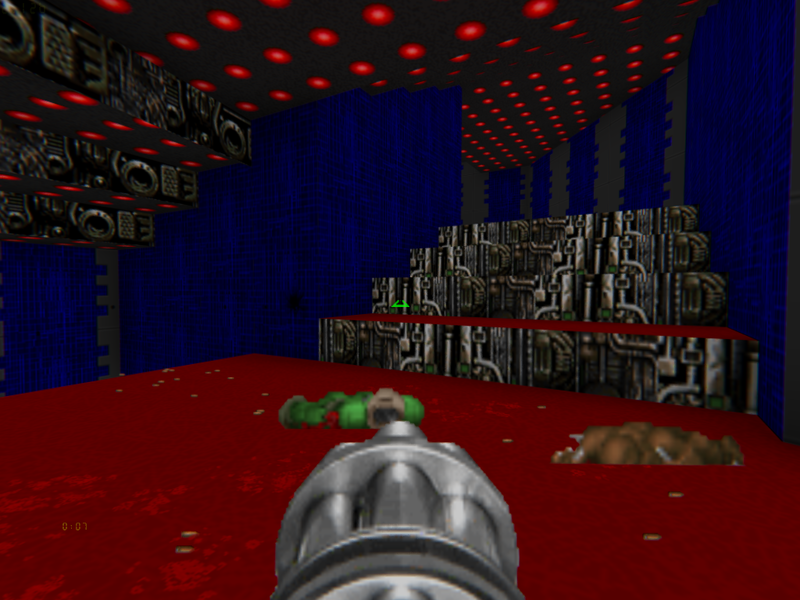 :D But I have to tell you the chaingun wasn't a secret! 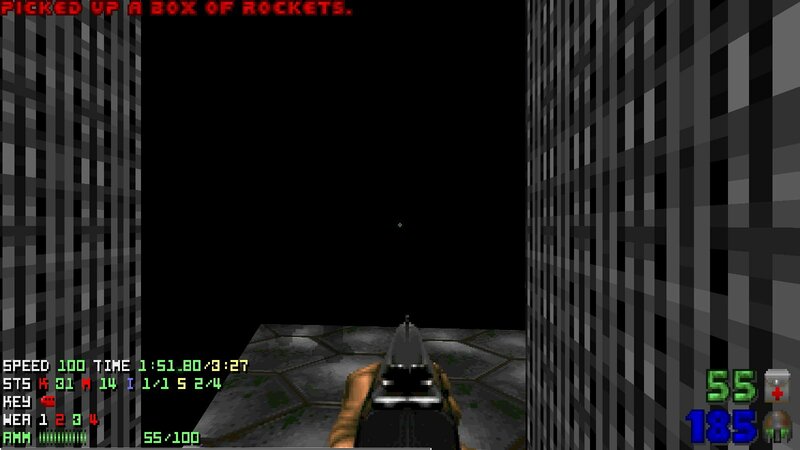 Lol In the beginning of the map to the left was the chaingun :) But I see your point. 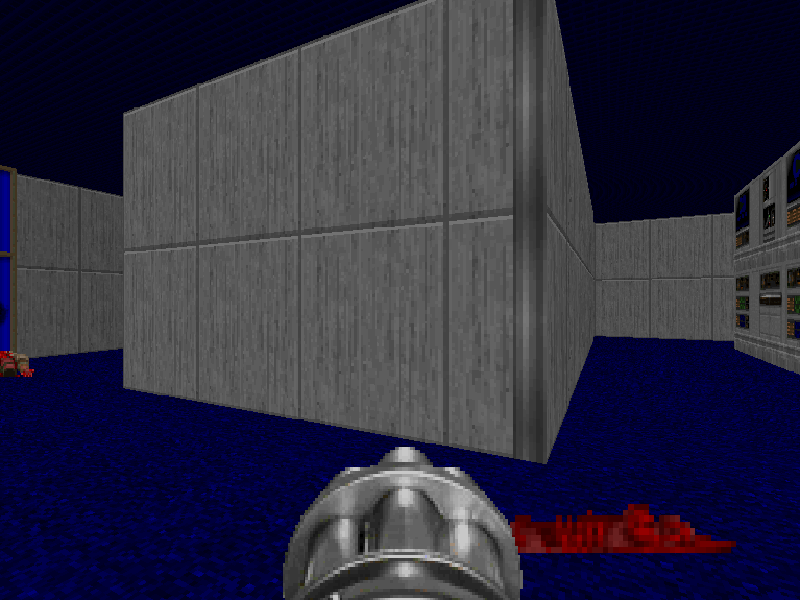 I should have accounted for people missing the chaingun entirely. Anyway thanks for the review! Thanks for playing my map! And yes! I was trying to make the map nonlinear! I'm glad you noticed that :) and yeah I'll be more ambitious with the lighting next time. Thanks for the review! So, I was thinking. Should I try to fix these issues? Or just move on to the next map and try to do better? Which do you think would help me better evolve as a mapper? Edit: Sorry for double posting! Which do you think would me better evolve as a mapper? I've done both. There are times you just fall in love with a map and want to keep building on it. Other times, you get new ideas and start something new. Either way works just as well for helping one develop their skills. Whatever you're doing, in other words, you're learning. It didn't occur to me that placing those blue lights near that door would make people think its locked. here, it is not brutally wrong, more on a side of "slightly unexpected", so it is not a big thing, just slightly confusing. 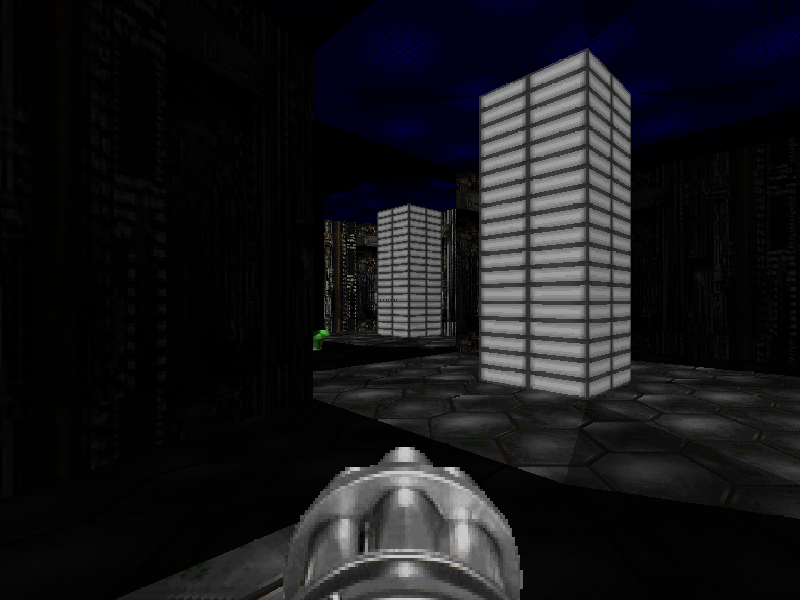 that is, player didn't seen how you used color codes before this, so it is unknown if you're using such pillars as detailing, or as code. if you will introduce locked doors before pillars so player can learn your style, you will get slightly more freedom in detailing. lighting. i remember that i said to not bother. but you already did some "lightwork", so... ;-) one of the dulliest things to look at is a room or a long corridor without light variations. you can cut some alcoves in walls, put some techlamp texture there, and make it casting light (like you did in the first room). this will look both more realistic (after all, there should be some light sources to emit all the light), and more interesting. also, i didn't even noticed that after taking the red key i have two cacos to fight. that is, i grabbed the key and runned away from there, completely missed the cacos. while it is great to have a way to avoid a fight, i'd like to get some hint that i have more meat to kill. ;-) like, dim lights in a corridor with cacos, for example: this will both create a tension, and make player aware of changes. and last, but very important: good start! the map is fun to play, and it has some non-linearity, so players can try various routes (this usually adds replay value). hope that all the criticism won't discourage you: i am pretty sure that we will see some great maps when you'll become more expirienced and will get used to editing tools! Should I try to fix these issues? Or just move on to the next map and try to do better? also, i didn't even noticed that after taking the red key i have t﻿wo cacos to fight. that is, i grabbed the key and runned away from there, completely missed the cacos. while it is great to have a way to avoid a fight, i'd like to get some hint that i have more meat to kill. ;-) like, dim lights in a corridor with cacos, for example: this will both create a tension, and make player aware of changes. Thanks for playing my map! This is great advice! I'll implement these ideas into Version 2 of my map. Compare the screenshot below to 9 inch heal's first screenshot! please, don't. that script-infested abomination is completely unusable. How is it unusable ? You just click the *Download* option and it's done. It has unlimited free space , no pop ups it . You can easily make an acount if you already have a Google acount. It can certainly be a few tedious extra steps, but thankfully, there are ways to make it one click, as pointed out, which is also true of Mediafire and Google Drive and pretty much anything. I believe marketing research says something like people really don't like to click more than a couple levels deep. First world problems, as they say, but it is what it is. How is mediafire bad exactly? Oh and thank you ! Played this as part of a playtesting stream this evening (fourth map to be played), and I found this one to be alright. Nice and short, I liked how you flipped the "corpses" monster closet reveal to be behind the player with the third one.